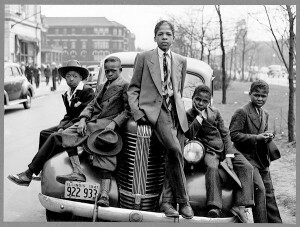 Home » About Photographers » A Gold Mine Of American Images– Free! 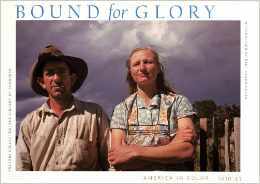 A Gold Mine Of American Images– Free! America, 1935. A land in the midst of a Great Depression. Drought and over-cultivation of farmland had spawned dust storms that stripped vital topsoil away. In a country that was predominately rural and small-town, the massive crop failure that ensued caused millions to lose their farms and homes. Blown out, baked out and broke, most were forced to drift aimlessly from place to place, looking for whatever work they could find, desperate just to stay alive. Though they were hired to photograph government-sponsored projects, their vision went far beyond that, showing the soul of America and the courage of its people. Even in the midst of hardship, the indomitable spirit of the nation shines through in images of family closeness, folks enjoying simple pleasures, and pride reflected in the faces of those who were getting their lives together again as the government’s “New Deal” began to put the country back on its feet. The guiding light of the FSA photo unit was Roy Stryker, a former college teaching assistant. During the eight years he headed the project (which in 1942 became part of the Office of War Information), 44 photographers were hired, fired and rehired (some several times) and others just quit. But about 16 would stay long enough to produce most of the images, acquiring distinctive visual styles as they exposed negative after negative. Stryker was not a photographer and frequently was heavy-handed both with his staff and with pictures that didn’t meet his esthetic or political requirements– he’d punch a big hole through negatives he didn’t like. But he was also astute enough to realize that aside from showcasing government-run projects he also had to show the plight of the people the programs were designed to help. And these are the images –like Dorothea Lange’s classic photo of a despairing migrant mother that, more than 75 years later, have endured. Because the project was funded by the government, the pictures are not copyrighted; you can download them as digitized files and make prints of those you like. Most of the best have been scanned at high enough resolutions to allow very big images to be printed. Some real gems in the FSA collection are the little-known color pictures that some of the photographers shot, grouped together for easy access. 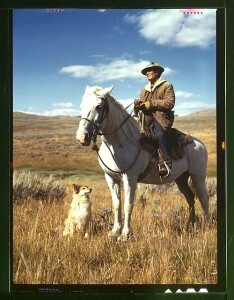 Using the only color film then available, Kodachrome with an ASA (ISO) of 10 (that’s “ten”), some photographers weren’t as comfortable with the new medium as they were with black and white; nevertheless some marvelous pictures were recorded. 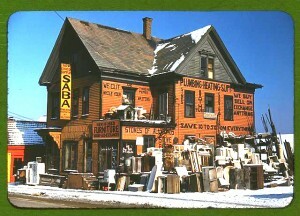 Beautiful scenics, reminiscent of Currier & Ives lithographs, powerful industrial photos, quirky bits of roadside Americana and striking images of people at work and play. Once downloaded and in your imaging program they’re easy to enhance and you can bring out nuances that would have been lost in the photographic printing processes of their time. Since you’re probably not going to be displaying pictures that are six feet wide, remember to downsample them to no more than 300 ppi after you choose their output size. I recently ran Red River Paper’s Ultra Pro Satin 3.0 13″ x 19″ paper through my Epson R2880 to produce some prints from scanned 4×5-inch color transparencies and 35mm slides. The results were absolutely breathtaking; even prints from slide scans were sharp and virtually grainless with brilliant color. Don’t overlook the black and white collection. 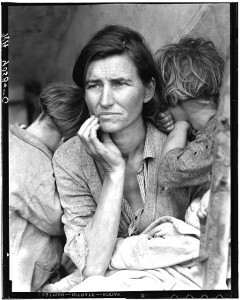 You’ll find Dorothea Lange’s famous “Migrant Mother” picture there among many others. Some black and white pictures give you a choice of downloading a scan from a print, from the original negative, or from a copy negative. Though the image from a print usually looks better on the web, the scan from the negative sometimes gives you more to work with once you get it into your imaging program. Scans from copy negatives are sometimes good and sometimes bad. Regardless of which scan type you download, some sharpening may be necessary and you may also have to tweak the brightness and contrast; just make changes until the photo looks good to you. The FSA photographers were in it for the long haul; they weren’t doing a one day shoot for a Day-In-The-Life book. On the road for months at a time and expected to follow shooting scripts that were sometimes 20 pages long, their unexposed film had to be mailed back to Washington for processing. They never saw what they had shot until they received a package of prints weeks later. Then they spent hours captioning their pictures before mailing them back again. It was exhausting work performed in numbing cold and sweltering heat, frequently coupled with bad food, primitive accommodations, and recalcitrant subjects who were suspicious of their motives. Going through the collections, you can’t help but admire their tremendous dedication as they set out to capture a reflection of bad times and the better ones that followed. To be able to print and display their images for your personal pleasure is a great posthumous gift from them to you. Take advantage of it; they would be touched by your appreciation of their accomplishments. 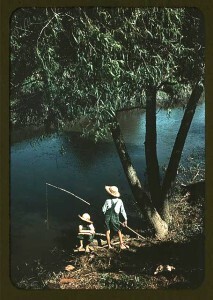 A collection of 175 images from the color collection of the FSA each with the photographer’s original captions and the month and year in which the shot was taken. A short section on Kodachrome ties it all together. Each picture’s catalog number is listed so you can easily access them at the FSA site and download those you want to print for your own personal use. Published by Harry N. Abrams in 2004, this is a high quality, hard cover, art book. 192pp. Available at Amazon.com – $25.00 new, from $8.00 used. THANK YOU for posting this very interesting and useful information for artists.